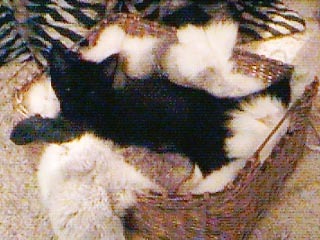 When I came home from the hospital my first week of life, I shared a crib with a beautiful Siamese kitten named Chan. Since then, I have always been in the company of cats. 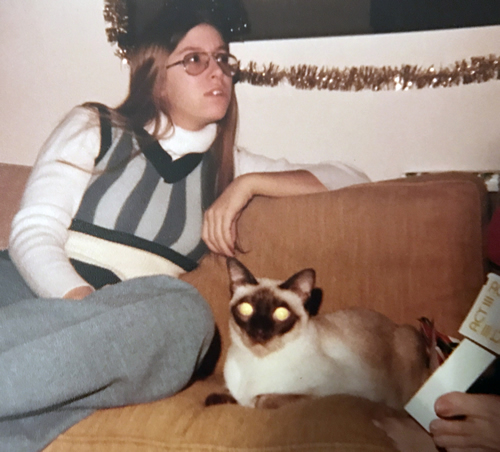 The Siamese on the couch with me (at 17!!!) is our second siamese, Fujiyama (Fuji). He lived to be 21 years old! For a long time, all my subsequent kitties were grown enough not to need any special care, and it was not until I returned from my honeymoon (with my 2nd husband, my favorite, so far...) that I was called upon to care for an orphaned 3 day old kitten. Suki came into our lives blind and deaf and very hungry! Since she was a kitten, she outgrew these symptoms except for the Hungry part! We tried to get the neighborhood feral community to admit she was one of theirs, but after they all inspected her, they shrugged and said "not mine!". You can read her story here and see pics of her throughout her life. On August 2, 2016, just before her 17th birthday, she went back to the angels after a long battle with diabetes-related illnesses. That's all I can say about that - cause I can't see the keyboard....I miss her so. My story continues as I was walking across the street to the grocery store. I saw one of my feral community cats dead by the side of the road. I instinctively thought, I better check the balcony, and sure enough, there were 3 newborns huddled in the corner. So....I put on my scrubs, got some goat's milk, and The MAMA™ came to be! I was able to home the kittens - one with my best friend! They have since passed on, but gave years of pleasure to their companions. So that's my first 4! A long time ago! 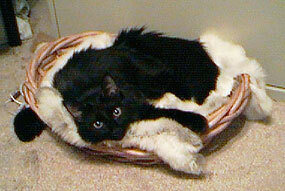 After Suki passed, I could not bear to get a permanent kitty, but I wanted to be around these wonderful animals. I remembered my experience with bottle feeding and contacted Abandoned Pet Rescue and it just so happened they had 2 orphaned kittens - TUTU & LOVEY. Since then, I contact the shelters when I start "Jonesing" for babies. UPDATE! On May 26, 2018, I officially adopted my doctor prescribed Komfort Kitty, Rocky. He will help me with any future litters (I hope). Please visit my resource page and Get Involved!